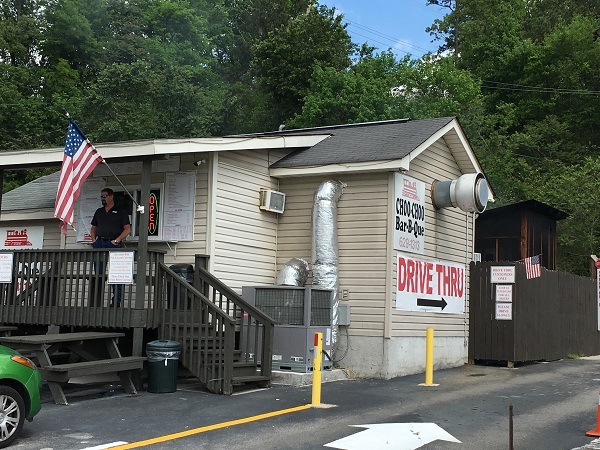 Choo-Choo Bar-B-Que, Chattanooga TN – Marie, Let's Eat! I visited three locations of this quasi-chain that has several independently owned stores in the region. Amusingly, each store’s cashier, when pressed, proudly claimed that their restaurant was the best. Because I am lazy and contrary and sometimes unfairly biased, there’s been a big hole in our stories about the barbecue around Chattanooga. 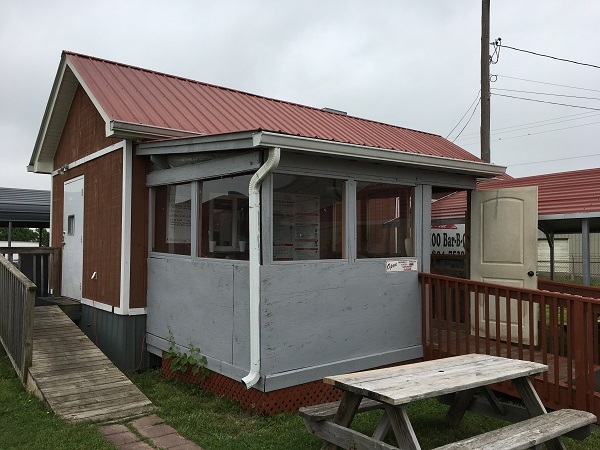 Dotted here and there, a small sort-of chain of fiercely independent barbecue restaurants has been doing business for something like twenty-five years. Because we haven’t had the best luck in the world with chains, especially barbecue chains, and because their independence means that nailing down all the locations of Choo-Choo is a complete pain in the rear, I set it aside for a rainy day or ten. I set it aside in 2011. That’s how lazy I can be. Finally, April came around, and with it, a sense that I could do better. I started looking at how many of these places there were. I counted three in Georgia, in Dalton, Chickamauga, and Ringold. Another, in Lafayette, closed in 2013. There seem to be five in Tennessee. The very first one was in Hixson, and later moved to Appling Street, right off Amnicola Highway. A second opened in Hixson, and then there are the three others that I chose to visit: on Ringold Road in East Ridge, on Quintus Loop off Shallowford, and on East Brainerd. Well, we’ve addressed the laziness, now let’s talk about my unfair bias. Since I don’t really enjoy very many barbecue chains, and since the barbecue around Chattanooga doesn’t set my heart on fire like a wild new song I want to hear again and again, I started telling myself that the further east you go in this state, the less thrilling the local chain was going to be. If you start in Memphis, you’ll certainly get a very good sandwich at a Tops. Around Nashville, the Stroud’s chain is not bad. It’s a clone of Whitt’s from northern Alabama. Not amazing, but passable. Jump over Hamilton County, and then around Knoxville, there’s Buddy’s, and only a sense of completeness compelled me to write even a sentence about those. I figured that Choo-Choo would fill some nebulous spot between Stroud’s and Buddy’s. 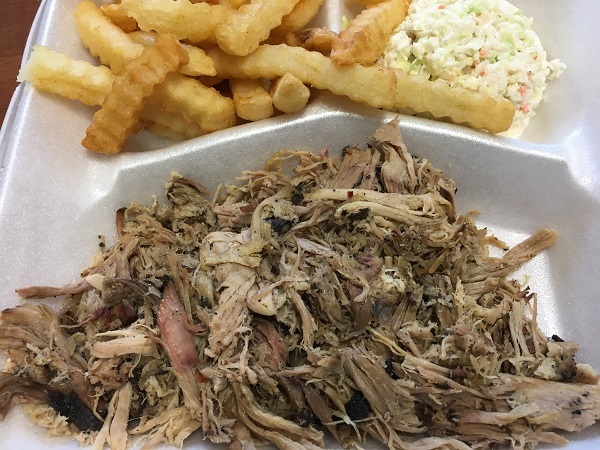 So one Wednesday in April, I pulled up at the Choo-Choo on Ringold Road and ordered the same thing I’d sample at each spot: a pork platter with slaw and fries. I learned there that each Choo-Choo was independently owned, and proudly so. The servers at this location told me that I didn’t need to eat at any of the others; theirs’ was the best. Buying into a Choo-Choo franchise gets you the recipes for sauce and slaw, logos, and some advice from their pitmaster, but otherwise they’re left to do their own thing, create their own menus and set prices as they please. Each of the three Choo-Choos that I tried did have some small variety in their menus. The one on Quintus surprised me by offering chopped weiner plates like we’ve seen at some of the older places in town like Miss Griffin’s and Memo’s. Chopped pork and chopped beef are the main sellers at each, and as I’ve mentioned previously, chopped beef is far more common around Chattanooga than it is around Atlanta, where it has largely been replaced on menus by sliced brisket. I did detect some noticeable differences in the flavor and texture of the pork at each stop. The pork at the East Ridge stop was unpleasantly greasy. The pork at Quintus Loop was even greasier. I couldn’t finish it, even after tamping it down. Should the road ever take me back to the Quintus store, I’m having the chopped weiners. 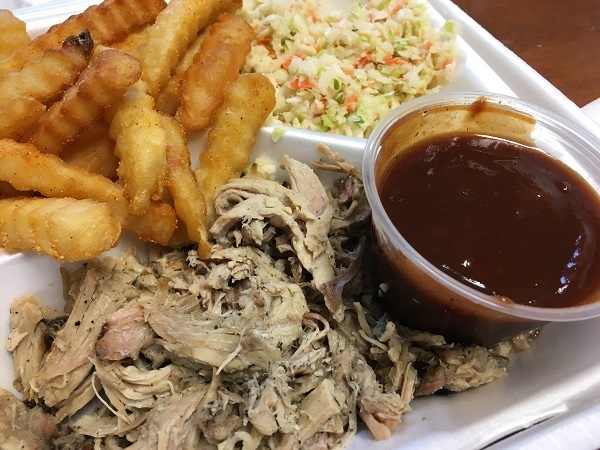 As for the sauce, it’s what you can expect from the overwhelming majority of barbecue places around Chattanooga: that brown, sticky-sweet goop with a chemical aftertaste. Every so often, I long for a bucket of a good vinegar-tomato sauce like I grew up eating around Athens. I hate that there’s so little variety around here. There are worse barbecue restaurants in town than the Choo-Choo on Quintus that we have not bothered documenting, but not many. Actually, the worst barbecue in Chattanooga that I had, by miles, was at a place that has since closed. It was Double Barrel on Signal Mountain. Holy anna. I’m not sure exactly how many barbecue places I’ve really visited, because there are around twenty, maybe twenty-five, that I never wanted to write about and therefore never bothered counting. Call it 460 restaurants in the seven years we’ve been writing. If I ranked ’em all, there might be only one I disliked more. Geez, that place. Anyway, so I was in low spirits when I forced myself to try another Choo-Choo, another place where I was assured I’d have the best meal any Choo-Choo would offer. And would you believe they were right this time? 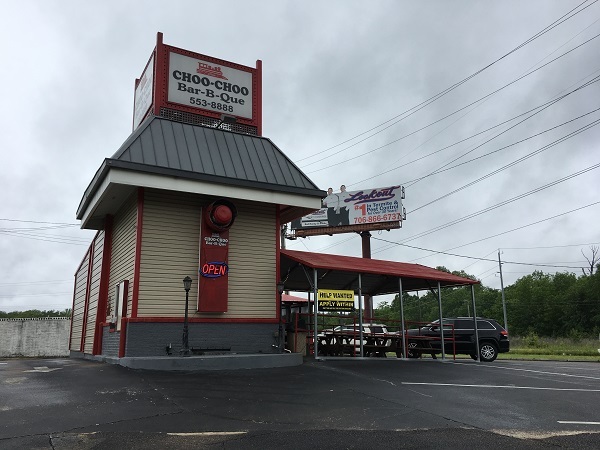 The Choo-Choo on East Brainerd, which set up in 2009 in the former home of a Central Park hamburger stand, was by far, by leagues, the best of the three, and not at all greasy like the other two. If I’m going to call the first two Choo-Choos that I tried under the bar for the Chattanooga average, then this one is above it. I mean it’s all broadly similar in texture and smokiness, but the East Brainerd store was definitely smokier, and not at all greasy. 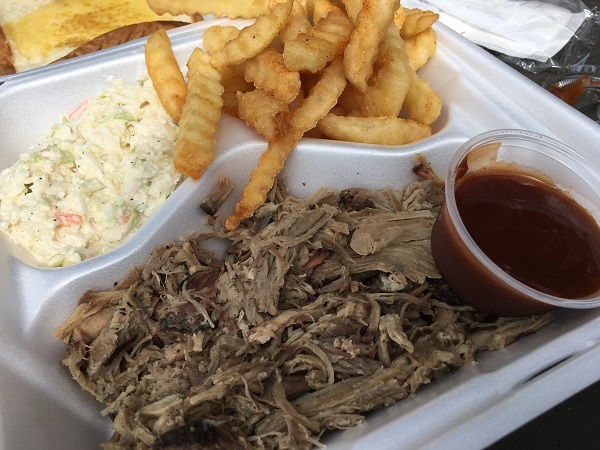 The sauce was the same tiresome goop, but if you believe that the best barbecue doesn’t actually need sauce and it’s just nice to have a little for variety, then this is the place to try. The employees were friendly and put up with my questions with good grace and put out a superior little product. I’d be happy to come back another day for more, and would like to try a few other things on the menu. Choo-Choo kind of reminds me of Armando’s, our local quasi-chain of burger places. Each one is more than just independently-owned, they’re independent in spirit as well. These really are different restaurants, even if their flavor profiles are very similar, and I won’t be finished with Chattanooga’s barbecue until I’ve been to each one. But I am lazy and contrary and sometimes unfairly biased, and so I’ll save the other two for another day. Maybe even this year. Are you planning a barbecue road trip? You can see all the barbecue restaurants that we have visited for our blog on this map, with links back to the original blog posts! Posted on July 7, 2017 July 7, 2017 by Grant G.Posted in barbecue, chattanooga, local chains, tennesseeTagged barbecue, chattanooga, local chains, not fooling anybody, tennessee. Growing up in VA I prefer eastern Carolina style, with Skylight being my last meal request. Spending 10 years in TX and now 20 in GA I’ve learned never to prejudge bbq.